Today I met my friend Glenn Campbell at his office at the NOAA Alaska Fisheries Science Center, located on the Federal facility once occupied by the Sand Point Naval Air Station. Once through a few checkpoints, I met Glenn and got a quick tour of the building, including a stop in a pretty smelly lab where I learned a bit about how they identified the species of fish and how the age of fish is determined by counting the rings in their ear bones. I was fascinated that there are fish (species that I’ve eaten like rock fish) that have lifespans that are beyond the human life span (who knew?). 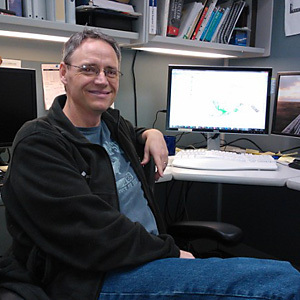 Glenn started working for NOAA while he was finishing his bachelor’s degree in fisheries at the UW (he had already earned an associate’s degree in fisheries); he’s now served NOAA for over twenty years. These days he builds and runs data systems that manage fish populations in federally managed waters off the Alaska coasts. Listening to his story, I was struck by the utility of his broad base of experience and training. He knows fish, fishermen, and the people who run fisheries. He knows computers, databases, and the satellite systems that help them all talk to each other (whether they are systems here in Seattle or a system on a fishing vessel in the Bering Sea). Glenn is obviously a motivated life-long learner, which has made him invaluable to NOAA as Glenn is eager to tackle new challenges and learn what he needs to know to solve the problems at hand. Not all that long ago he earned another degree, this one in business at Northwest University. I asked him why, since it wasn’t the sort of thing required by his work, and wouldn’t necessarily position him for advancement in his position. My summary of his response: he wanted more tools in his toolbox. Glenn determined to sharpen the ol’ ax… and it has paid off. He said he appreciated the Bible and theology classes that were part of the program. The opportunity to study his faith with college-level courses taught by highly qualified Christian professors provided a sharper ax that could be applied to every area of his life. It was fun to hear him talk about how he is applying the skills developed in his business studies. Even though much of his day is spent dealing with in databases and statistical analysis, it is often the interface with people that brings the most success. With the rapid pace of change he manages, he is continually rolling out new programs that need to be embraced by the people on the field… whether that is NOAA personnel, people in the fisheries, or fisherman at sea. He said that his fisheries background and education is vitally important, but it may be the marketing, project management, presentation, and leadership skills that are the most useful to him these days. I’m really proud of Glenn and his work. His efforts translate directly to the care of God’s creation as his work supports important decisions about how populations of fish are sustained for the future. He also plays important roles in commerce (creation of wealth) as well as feeding people in the US and around the world as he partners with fisherman and fisheries. Pretty impressive stuff Glenn… thanks for taking time with me today! Good writing about an interesting person. Cool story about Glen! Everyone should have a really cool story written like this to share the intricate details that we might not learn about a person even after knowing them for almost 15 years. So many of us spend so very many hours at work, and yet so few people really understand what all we do during that huge percentage of our lives. It is really cool to see this side of Glen. I am enjoying this blog and getting to know my friends at Pleasant Bay!